Headquartered in Chennai(India), we are a renowned name presenting a huge gamut of products. Purchasers will not be disappointed buying our range of product, as it adheres to industrial quality regulation systems. 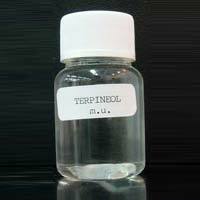 Terpineol is a naturally occurring monoterpene alcohol that has been isolated from a variety of sources such as cajuput oil, pine oil, and petitgrain oil.Terpineol is usually a mixture of these isomers with alpha-terpineol as the major constituent.Terpineol has a pleasant odor similar to lilac and is a common ingredient in perfumes, cosmetics, and flavors.